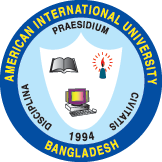 The 4th orientation ceremony for the newly enrolled members of AIUB Community of Engineering Students (ACES) was held on Thursday, 10th March 2016 at the Auditorium of American International University-Bangladesh (AIUB). This much awaited and exciting event commenced at 4 p.m. with inaugural speech from the Advisor of ACES, Prof. Dr. A.B.M Siddique Hossain (Dean, Faculty of Engineering, AIUB). He welcomed all the new members and praised about the activities of ACES. Then he shed light on the importance of participating in extra-curricular activities. Welcome speech was given by the Advisor of ACES, Dr. Md. Abdur Rahman (Director & Associate Professor, Faculty of Engineering, AIUB), where he congratulated ACES on its 4th Orientation as well as for all the achievements throughout the year and wished tremendous growth and eminent goodwill as a student organization in the near future. Gifts were presented to both the advisors by the motivators of ACES, Ms. Shahreen Hassan (Lecturer, Dept. of EEE, AIUB) and Mr. Sayed Muhammad Baker (Lecturer, Dept. of EEE, AIUB). The event continued with an informative presentation by the Ex-Chairperson of ACES, Mr. Suvro Russel Modhu where he stressed about ACES and its activities; missions and vision for the better understanding of the members. Then the Mentor of ACES, Mr. Md. Saniat Rahman Zishan (Assistant Professor, Department of EEE & Special Assistant, OSA, AIUB) presented the history of ACES. He also stressed in his speech how ACES has helped Faculty of Engineering students of AIUB. Motivators of ACES Mr. Sayed Muhammad Baker and Ms. Shahreen Hassan also shared their experience working with ACES. There was an exciting quiz session and the ones with the correct answer were presented with attractive prizes. The Advisor of ACES, Mr. Chowdhury Akram Hossain (Assistant Professor, Department of EEE & Special Assistant, OSA, AIUB) wished new members to have a pleasant journey with ACES. After that, new committee of ACES for the year 2016 was declared by the Advisor of ACES, Mr. Chowdhury Akram Hossain and Mentor of ACES, Mr. Md. Saniat Rahman Zishan . Lastly, the names of the raffle draw winners were announced. The final segment of the event was the distribution of ACES t-shirt and food among the newly enrolled members. The event was also graced by the presence of Ms. Sumaiya Umme Hani (Lecturer, Department of EEE, AIUB), Mr. Shahriar Hasan Shehab (Lecturer, Department of EEE, AIUB) and Mr. Kazi Ahmed Asif Fuad (Lecturer, Department of EEE, AIUB).